Ok, girls...I was at it again! This stuff seems to find me, rather than me finding it. I swear. I hit some estate sales and thrift shops this past weekend...and here is what I dragged home with me. and the clocks, scale and fan will be at the May show, too. Oh, and I can't forget the vintage metal number 8 and letter G...I buy those whenever I find them, too. 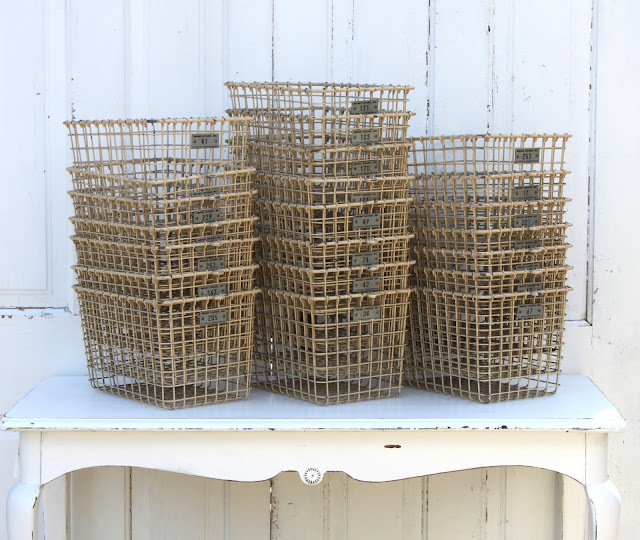 22 MATCHING vintage locker baskets! Love the patina, love the cream color paint...within 2 seconds I had a project for them in mind! I just haven't told my hubs yet...but he is going to make me a long...low...cabinet to hold these in my work studio. Then my sister...she does all my sewing...gets the task of making me 22 liners that fold over with litte ruffles out of some white vintage linen I have been stashing. I hope they both still love me after this project! I think it will look fabulous...and will be perfect for sorting and storing all my fabric! I love the weekend. 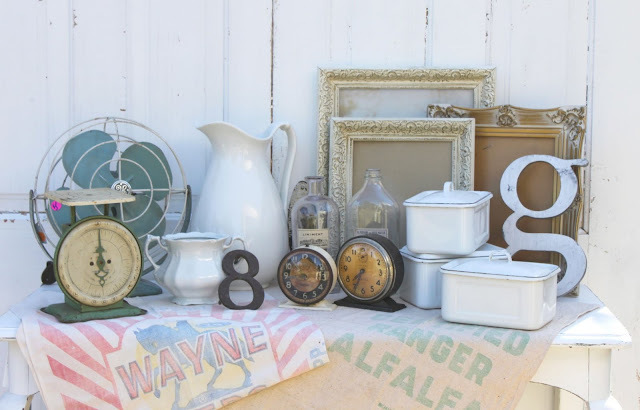 The junking bliss starts on Thursday & Friday around here...thats when the estate sales happen...and I usually make the rounds of my favorite little junk shops on the weekend when they are getting the most donations. Now, I am off to see the 2 guys I told you about a few weeks ago that have a basement full of vintage chandeliers for sale! I really hope it won't be too dark for photos...I know its going to be good...so I have to show you what I find! great finds. I actually love every single item. and the locker baskets. awesome! can't wait to see how they turn out! sounds inspired. Love it all! You lucked out on those baskets... love what you have planned for them. Hopefully I will have good vintage karma at our flea market this weekend. 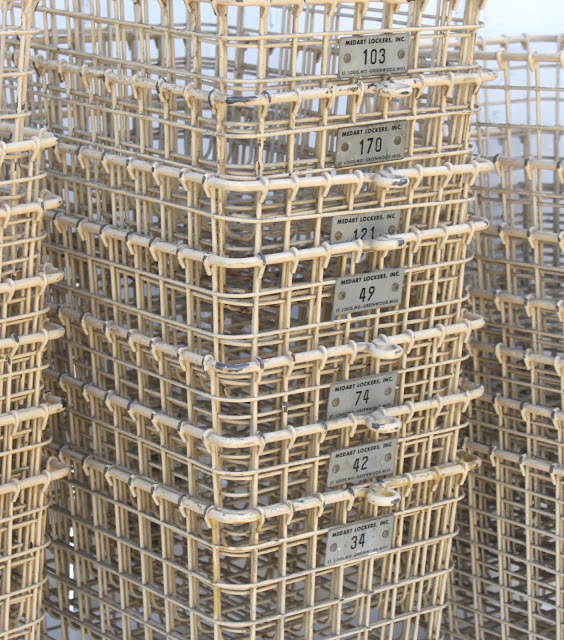 Those baskets are really fantastic! Lucky girl you are! Oh My goodness, what a haul. And what a find on those baskets...such a nice plan to do a ruffled liner. OH WOW...those baskets are FAB! Your background for your treasures is perfect. Goodness girl you found some amazing stuff, love it all and I mean all of it!! the baskets are perfect~~ can you send me a couple, pretty please!! :) I need to come and jumk with you ASAP!p.s. sorry I was busy yesterday doing nothing but I got your e-mail....thank you thank you thank you, you bless me huge!! Awesome goodies, I love the fan and does that say $5.00? that's awesome!! I love those locker baskets, what a great find!! Oh my gosh... can I be you??! Please... just for a day?! I honestly envy your job/lifestyle! Wow, you always find the best stuff!!! You are really a lucky girl! WOW! So great stuff, especially the baskets are so fantastic!!! WOW you hit the jack-pot! Wow...really...you gotta be kiddin' me...now that's what I call...a dreamy junkin' day...I'm so lovin' it ALL! Oh man - I can't pick my jaw up off the floor with all those locker baskets! Seriously Mary - you lucky lucky gal! I love the other loot too, but that was a great find! The locker baskets are amazing and I would totally use those, but oh! My heart beats faster with the enamel lidded containers. Oh, I just tingle inside looking at them! Lucky you~ enjoy! Wow! That stuff is unbelievable!! So, so cool. Love all those baskets--can't wait to see the finished project. Can't believe there were so many of them! What a great weekend for you! Wow, what awesome finds! You really did well. I can't wait to see how the locker baskets turn out. What fun finds, I love seeing all your fun stuff makes me a little jealous... those baskets are perfection! Have fun looking at chandeliers, one of my favorite things to do! Is it okay to hate you? C'mon.... a little? Okay okay, I'm JEALOUS. There I said it. Nice finds woman. You're a magnet for AWESOMENESS! btw...come by & see my final bedroom reveal & enter my jeanne d' arc giveaway!! Wow, you really hit the jackpot! I love your treasures!! I love the locker baskets!! Can't get enough of those!! Great blog, I'll definitely be back! The lockers are really awesome! Great find as usual. Wow, you really hit the jackpot! THey are all so wonderful! Thanks for sharing!! Mary...you are one of the best shoppers that i know...seriously you find the ABSOLUTE best best items!!! I cannot wait to see all of your projects unfold. Mary...my jaw hurts from dropping. I think I might even have drooled a little bit. You hit the mother load with those baskets and your project I'm picturing is just LOVELY!!! Ahhh...and I was already thinking your other finds were so neat. Wow...lucky duck! I have 1 locker bin....one! Ooh, ooh, ooh, put an African violet in the sugar bowl!!! Wow! That stuff is beautiful. What a find. Okay Mary, I want to be happy for you with all your finds, every. single. one. of which I am blown away by, but I'm struggling with flat-out jealousy. Envy. And it's not pretty. That locker basket project will be the coolest thing the vintage loving world has ever seen. Ever. And, I'm convinced that Montana does not posess a single vintage number or letter. I've looked. Not here. What an amazing haul. Okay, I'm off for a major attitude adjustment!! Have fun with all your goodies! those are such great items!! i love the vintage clocks!!! great finds!! !